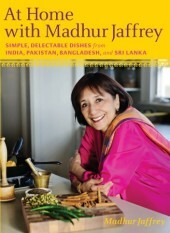 If you love the magical flavors of good Indian cooking and want to reproduce effortlessly some of the delectable dishes from that part of the world, open this groundbreaking book from the incomparable Madhur Jaffrey. By deconstructing age-old techniques and reducing the number of steps in a recipe, as well as helping us to understand the nature of each spice and seasoning, Jaffrey enables us to make Indian dishes part of our everyday cooking. A lover of eggs and chicken dishes, Jaffrey focuses on fresh and easy ways to cook them, including her favorite masala omelet and simple poached eggs over vegetables. There’s chicken from western Goa cooked in garlic, onion, and a splash of vinegar; from Bombay, it’s with apricots; from Delhi, it’s stewed with spinach and cardamom; from eastern India, it has yogurt and cinnamon; and from the south, mustard, curry leaves, and coconut. Jaffrey offers a wide range of dishes for lamb, pork, and beef, with important tips on which cuts to use for curries, kebabs, and braises. She includes a tempting array of vegetable dishes — from everyday carrots and greens in new dress to intriguing ways with eggplant and okra — served center stage for vegetarians or as accompaniments. At the heart of many Indian meals are grains and legumes, as well as the little salads, chutneys, and pickles that add sparkle. Jaffrey opens up a new world of these simple pleasures. Throughout, Jaffrey’s knowledge of and love of these foods is exhilarating. Here are the dishes she grew up on in India and then shared with her own family and friends in America. Now that she has made them so accessible to us, we can incorporate them confidently into our own kitchens, and enjoy the spice and variety of this delectable cuisine.